Turquoise Hill Resources announced in early May that the boards of Oyu Tolgoi LLC, Turquoise Hill, and Rio Tinto have approved the restart of development for underground mining at the Oyu Tolgoi copper-gold-silver mining complex in southern Mongolia. Oyu Tolgoi LLC is jointly owned by the government of Mongolia (34%) and Turquoise Hill Resources (66%). 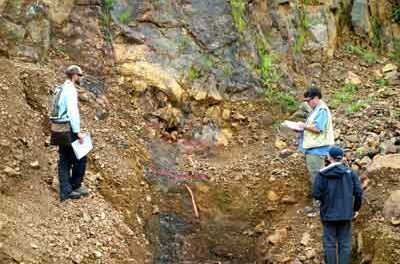 Rio Tinto is 51% owner of Turquoise Hill and is the project manager. Oyu Tolgoi currently produces from an open-pit mine that came into production in July 2013. Production in 2015 totaled 202,200 metric tons (mt) of copper and 653,000 ounces (oz) of gold in concentrate. Work on a massive block cave, underground development project was suspended in August 2013 due to shareholder disagreements. Current planning for resumption of underground development assumes a five-year construction period, with first underground production around 2021. A five- to seven-year ramp up period will follow. At full production, the underground mine will produce 95,000 mt/d of plant feed, and the Oyu Tolgoi plant will produce more than 500,000 mt/y of copper in concentrate. Underground mining will be based on the Hugo Dummett North deposit, which contains probable ore reserves of 499 million mt at an average grade of 1.66% copper—more than three times the grade of open-pit ore—and 0.35 g/mt gold. Processing of underground ore will utilize the existing concentrator and infrastructure. Capital cost to complete the underground development program is estimated at $5.3 billion. Rio Tinto Deputy Chief Executive Jean-Sébastien Jacques stated, “Today’s investment decision takes Oyu Tolgoi to another level and will transform it into one of the most significant copper mines globally, unlocking 80% of its value. Long-term copper fundamentals remain strong, and production from the Oyu Tolgoi underground will commence at a time when copper markets are expected to face a structural deficit.